If you just graduated from school or are looking to make a career change you need to keep reading! If you are looking for an opportunity that can offer you room for advancement, company benefits, and a workplace culture unlike any other then you have landed at the right place. pt Health is a Community Clinic Network with 230 corporate and network clinic locations across Canada. Our multi-disciplinary clinics offer a mixture of physiotherapy, massage therapy, acupuncture, chiropractic care and much more. We currently have positions open at multiple Clinics across Canada. pt Health’s culture is about providing our employees with the tools necessary to give excellent patient care. We support, inspire, and work as a team to achieve this goal. Our commitment to be innovators in extended health care, which keeps our employees motivated and connected to the community. Just last year pt Health was the first physiotherapy provider to officially be certified as a Great Place to Work through Great Place to Work Canada. We were also named on the 2018 list of Best Workplaces Managed by Women. We believe in gender equality in the workplace and will continue doing our part to create a community with equal advancement opportunities. 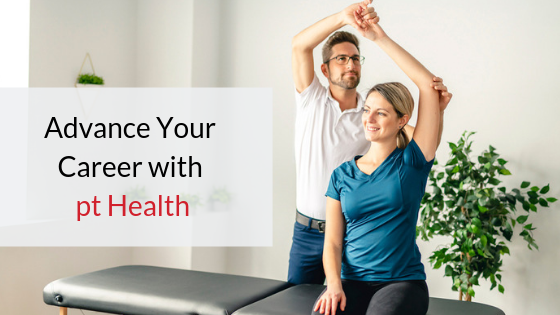 Every position at pt Health comes with the opportunity to learn, grow, mentor and be mentored in an interdisciplinary clinic setting by some of the best clinicians in Canada. There’s no better place to be a “forever student” than pt Health. We value learning so much that professional development and continuing education opportunities are standard for every position. We also offer unlimited continuing education supports for professionals who want to achieve further certification and advance their skills. Choose to be an hourly, split fee employee or contractor. We offer competitive pay, extended health and dental benefits, automatic RRSP contributions, monthly bonuses, free physio, and other employee discounts, moving allowances too! If you are currently enrolled in school, a recent graduate or are looking to make a career change we want to hear from you. You can browse our current opportunities on our website or if you aren’t quite ready to pursue employment get in touch with us so we can update you on future postings.